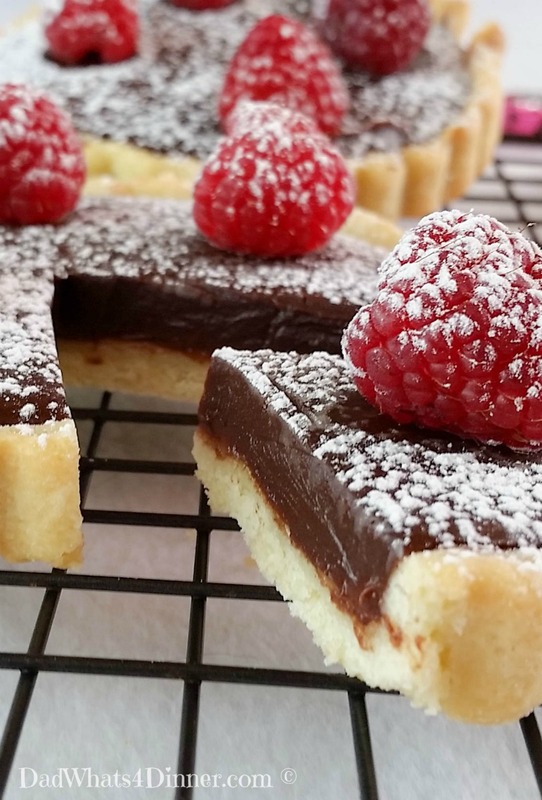 If you want to impress your significant other, make this Chocolate Raspberry Tart. 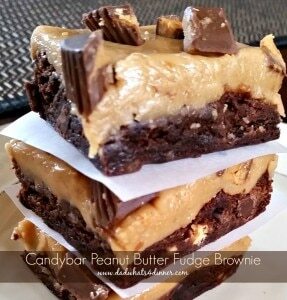 The ultimate Valentine’s Day dessert! 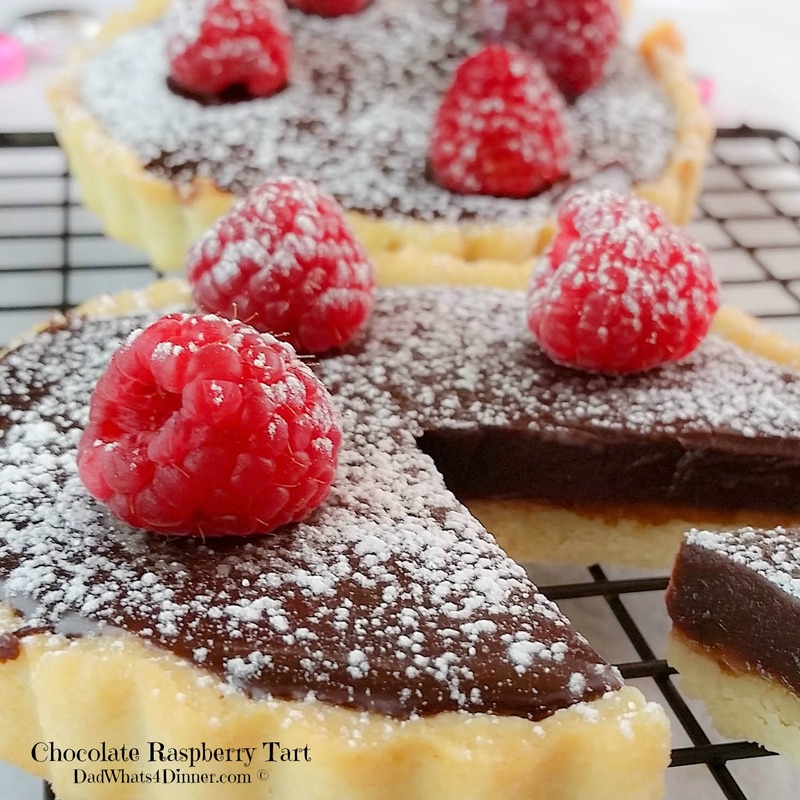 I made my tarts using awesome mini tart pans from Wilton, which have a removable base for easy tart removal. The tart can be made in a full-size tart pan or even a pie plate if needed. The flavors of the semi-sweet chocolate and raspberry go so well together. Just enough sweetness to the tartness of the raspberry jam, along with the yummy flaky tart crust. To make the crust for my Chocolate Raspberry Tart, I used Williams Sonoma‘s recipe for Basic Tart Dough. It is an incredibly simple dough that would be perfect for many types of tarts and pies. I tried to make a jelly roll out of the dough but the butter content was a little too high. Tasted great but did not hold together well. The dough can be used immediately or covered in plastic wrap and kept in the fridge for a day. While the tarts cool, make the easy ganache by bringing the cream to a simmer then immediately pouring over the chocolate. Let sit for 1 minute, then whisk to combine. This technique makes a wonderfully smooth ganache that sets up well. For the jelly base, I used Polaner Seedless Red Raspberry All Fruit. Being seedless, it is perfect for baking and spreads easily. Not too sweet. After filling the tarts with the ganache, let them set up in the refrigerator for a couple of hours. When ready to serve dust with confectioners sugar. My wife and daughter couldn’t stop eating the scraps of dough as I trimmed the tart before baking. They were like little puppy dogs waiting on table scraps. Okay, awesome Chocolate Raspberry Tart or not, telling you my wife is eating dough like a puppy dog is not going to keep me in her good graces. I might be in the doghouse soon. 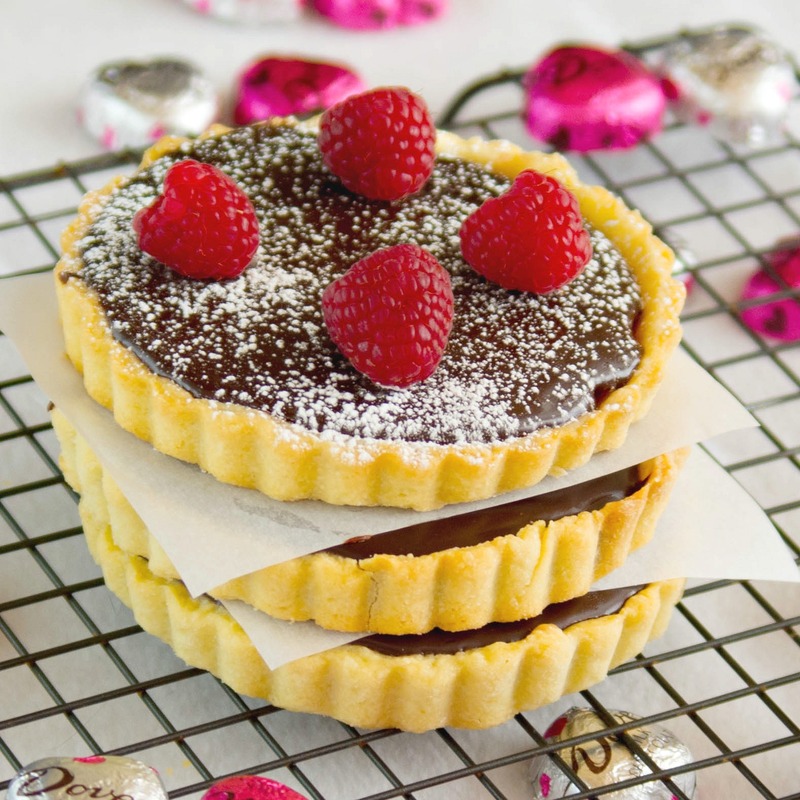 Make these tarts for your sweetie and I guarantee you will have a wonderful Valentine’s Day. 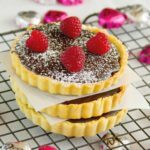 If you make my stunning Chocolate Raspberry Tart for your Valentine, I guarantee you will have a good night. Lightly coat tart pans with cooking spray, set aside. In a stand mixer, fitted with the flat beater, stir together the flour, sugar and salt. Add the butter and beat on medium-low speed until the texture resembles coarse cornmeal, with butter pieces no larger than small peas. Add the egg mixture and beat just until the dough pulls together. Transfer the dough to a work surface, pat into a ball and flatten into a disk. To make mini tarts divide into 6 balls. On a lightly floured board, roll out the dough with 6 to 8 gentle taps of the rolling pin. Lift the dough and give it a quarter turn. Lightly dust the top of the dough or the rolling pin with flour as needed, then roll out until the dough is about 1/8 inch thick. Carefully lift dough and place on top of prepared tart pan. Gently press dough into pan. Use a small, sharp knife to trim the excess dough from the top of the tart pan. Use knife to poke a small hole in the bottom of the dough. Bake 15 - 20 minutes until golden brown. Cool completely before filling with ganache. In a heavy bottom pot, bring the cream to just a simmer. DO NOT BOIL. Pour cream over chocolate and allow to sit for 1 minute. Whisk the cream and chocolate until smooth. Spread 1 Tbsp of raspberry puree on bottom of cooled tart crust. Pour chocolate ganache over raspberry jam. Allow to chill in fridge for at least 1/2 hour until ganache is set. When ready to serve, dust with Confectioners Sugar. 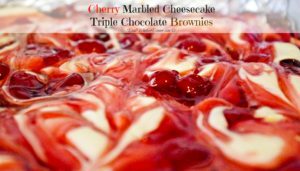 -Makes enough dough for one 9 1/2-inch tart, six 4-inch tartlets, twelve 2-inch miniature tartlets or one 13 3/4-by-4 1/4-inch rectangular tart. 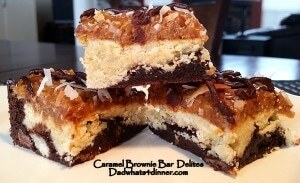 Check out some of my other tasty desserts! 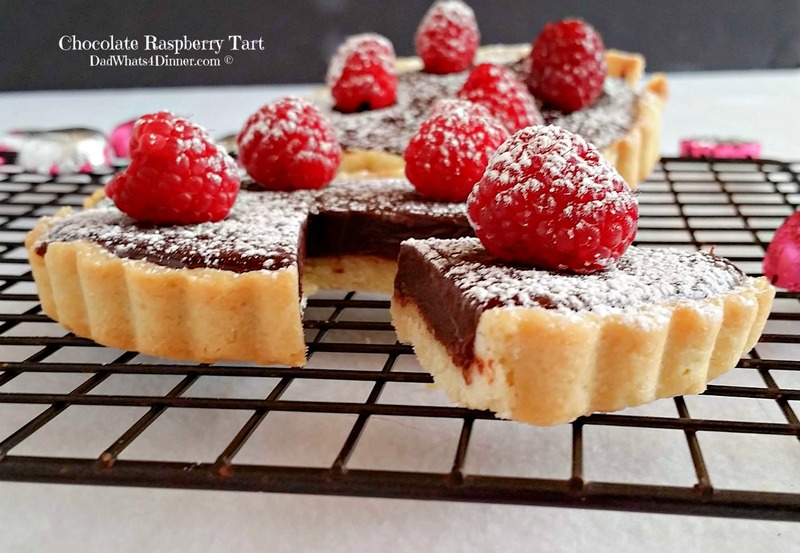 These tarts are just gorgeous and your photos are drool worthy! What a beautiful treat! YUMMMM! Thanks so much for sharing with us at Weekend Potluck. Trust you and yours enjoy a great Valentine’s weekend. Thanks Marsha, Thanks for hosting and I hope you have a Happy Valentine’s too. I love this dessert 🙂 Chocolate and Raspberry is such a wonderful combination of flavours and perfect for Valentine’s day! Thanks Dini. The flavor combination was incredible. Have a Happy Valentine’s Day. Love the tart! The combination of chocolate and raspberry is irresistible! Happy Valentine’s Day! My wife and my neighbors loved the flavors of the tart. They go so well together. Thanks for stopping by and Happy Valentine’s Day. Thanjs Jhuls. Have a great weekend and a Happy Valentine’s day. They sound amazing and look perfect! Have a great Valentine’s Day, Quinn! Wish I could give you one. Happy Valentine’s Day Judy. 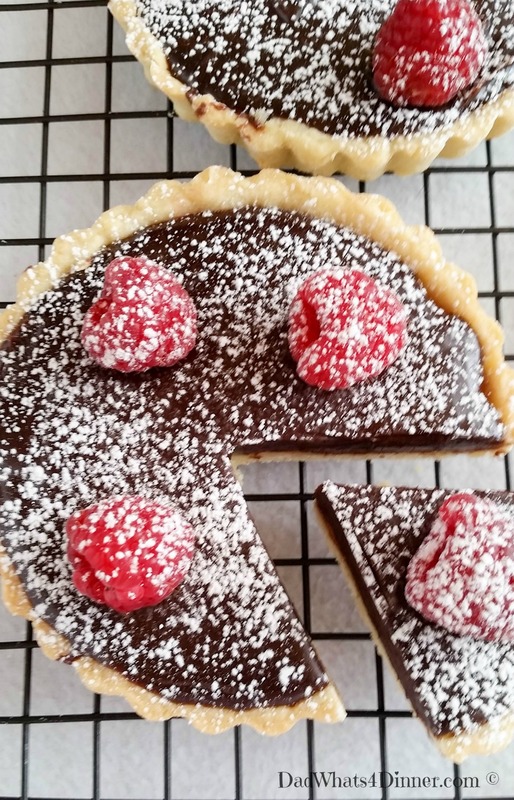 These chocolate raspberry tarts! They look so perfect for Valentine’s Day! Happy FF! These really look absolutely PERFECT, Quinn!! Very impressive and delicious, I’m sure. Lovely pix too. Thanks for your kind words Josette. I was pretty proud of how they turned out. Quinn, you’ve outdone yourself~these look amazing!